What Is A Credit Spread? Buy Low, Sell High… VS …Buy High, Sell Higher? The Big Short (2015) Movie Review – An Oscar for Steve Carrell or Christian Bale? What is Overnight and Weekend Trading Risk? Options Vs Stocks: Which Is Better? &nbsp;Yesterday at the close we had the c-wave of wave to rally. Then by the night session thing ms reversed and wave 3 began. But wave 3 was not able to break 2050– so it decided to do a wave 4 really high and then backing off – indicating that this is likely forming a diagonal. 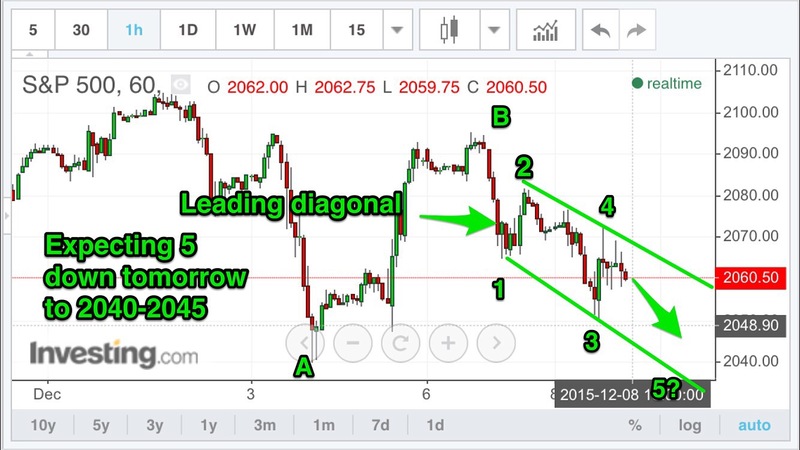 Tomorrow is likely to finish a wave 5 to complete this leading diagonal. Then an a-b-c wave 2 and then perhaps a big wave 3 down after that. But we take it day by day and see how the market reacts. So far our position is doing quite well as we bet that the SPY would stay below 210 and at today’s close it was well below 207. We may close for profits tomorrow one day earlier than expiration if we are close to 90% of profits. StockSurfer is a former hedge fund derivatives trader at a Wall Street Investment Bank (Prop Trading Desk) and has been trading the markets since 2002. He received a B.S. in Management Science from Stanford University with a focus on Finance and Decision engineering. He was actually in the audience during Steve Jobs' now famous graduation speech. This trading education blog is partly a result of the inspiration from that speech. Here at LifeStyleTrading101, Mr. CryptoSurfer serves as Head Trader sharing not only his market views and trades publicly, but also his passion and vision to educate everyday people with real-life practical skills in how to make a little extra money in the global financial markets. You've seen his expert wave analysis of the markets above. Now you can subscribe to his Trade Of the Week premium service to learn exactly how he is trading today's market, week after week. Wkd, 2/2/19 2700ES – Where is Resistance?